Oil on panel, 37 x 49 cm. 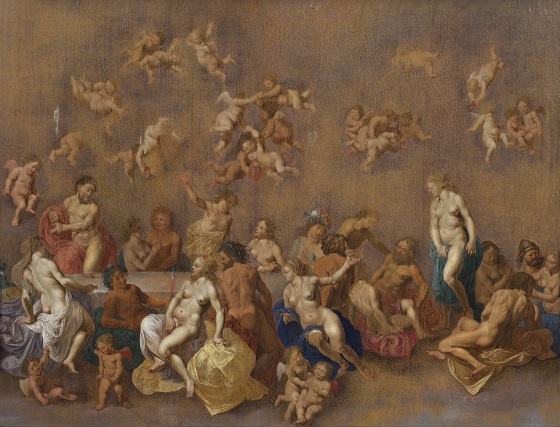 A group of putti are merrily floating above the Olympian gods, who have gathered around a dining table to partake in a feast. Although the Utrecht painter Cornelis van Poelenburgh is primarily known as one of the greatest painters in the category of Italian-inspired landscape painting, he also painted a number of mythological and biblical scenes where the study of the human body was at the heart of the subject. This small oil painting shows Poelenburgh’s ability to depict naked figures in a variety of dynamic and complicated positions. The scene is most likely inspired by the Roman poet Ovid’s Fasti, a six-book poetic work that explained the background for the holding of certain Roman festivals with the help of the ancient myths. Ovid describes a number of feasts on Mount Olympus where the gods revelled in an abundance of drink and food.